Hibiscus syriacus brings a refreshing burst of tropical-looking blooms just when the garden needs a boost! 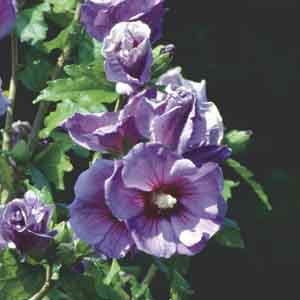 Varieties are available with single or double flowers in a range of colors. Beautiful as a garden centerpiece, yet also effective as a hedge. A classic favorite for landscape focal points. An excellent specimen, foundation, or border plant. Nice for larger patio containers. For best results, plant in slightly alkaline, fertile but well-drained soil. Keep soil moist, watering freely in dry weather. Breaks dormancy late so be patient for spring growth.